This collection is an ode to high-quality, traditional craftsmanship. 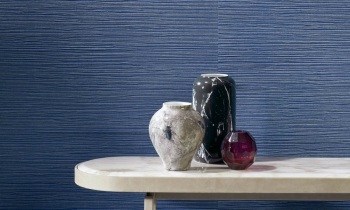 The wallcovering is made of pure, natural materials, from minerals and grasses to tropical plants. Experienced artisans pleat, weave and dye with boundless passion and patience. 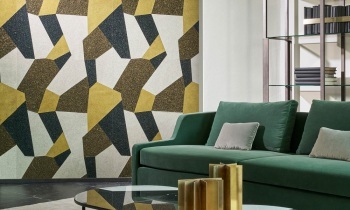 They turn these materials by hand into beautiful, unique wallcoverings. Made of real mica flakes*. The sheets with the mica flakes are hand-dyed, after which large, irregular shapes are punched through them. These are carefully inlaid into a repetitive pattern. The pattern is a modern interpretation of the colourful, classic terrazzo floors. Large sheets with mica flakes* are hand-dyed for this pattern. Then rectangles are stamped out of them with the utmost care. These shapes are then glued by hand into the pattern, so that they impart a beautiful yet not too rigid effect. For some wallcoverings, we use mica in a single colour, while in others we combine three colours in a random pattern. This pattern consists, as it were, of woven mica*. First, sheets are coloured with glued mica flakes. They are cut into very narrow strips, which are then woven with a conventional loom. 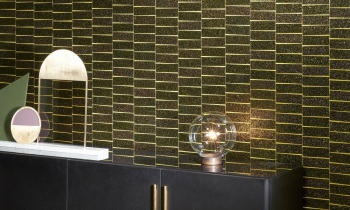 The result is a wallcovering with the look of a very fine, gently glistening mosaic. Made from natural sisal fibres which are very finely woven. The woven sisal is then hand-pleated. Finally, we use the tipping technique, in which metallic ink is applied to the tips of the pleats. 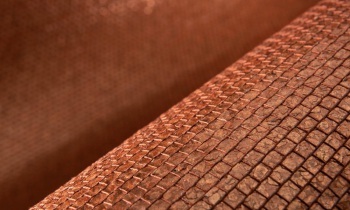 This yields a living, totally unique wallcovering, brimming with character. An authentic double-weave jute. The jute strips are first dyed and then woven. This fabric is glued onto a shiny metal foil or a matt base, and then it is all cut into strips again. Finally, these strips are woven once again. 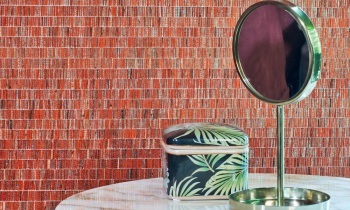 The basic material for this wallcovering is a tropical plant, the pandan. The fibres of this plant are interwoven by hand. This braiding is cut diagonally into strips, which are then woven. 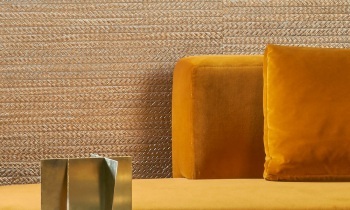 We drew the inspiration for this wallcovering from the growing trend of braiding in fashion and interior design. *Mica is an umbrella term for a group of minerals.